I purchased this for the bed in my guest room and it is perfect. Feels like good quality and it is soft. I ended up having to sleep in there one night when I forgot to dry the sheets for my bed (oops) and I didn't get too hot or too cold. The Porch & Den McMillan comforter set is the perfect choice for anyone looking for quick, convenient, and stylish bedding. This three-piece set includes a comforter and shams in your choice of several classic colors. Double brushed microfiber materials are soft to the touch and machine washable for your convenience. Easy to care for and easy to coordinate with, this set is ideal for dorm rooms, kids' rooms, or even guest rooms. Great quality and super soft! Comforter is just what I was looking for so soft nice stitching worth the money, not cheaply made, great for my son's room exact color match to description quality item color is beautiful! Fast shipping! 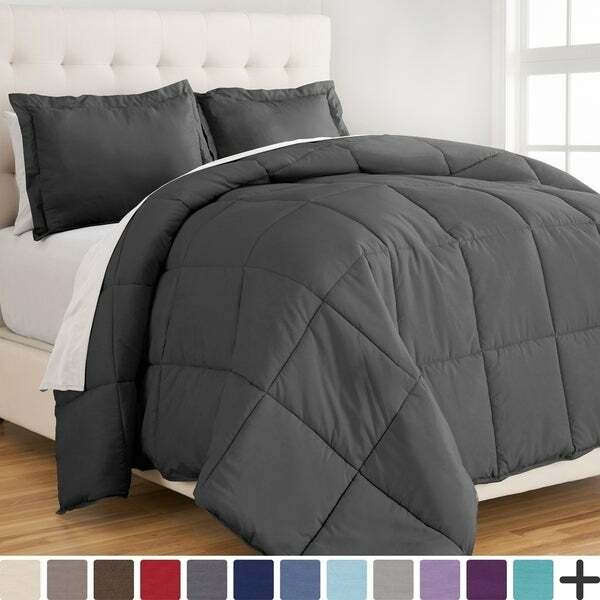 This comforter is a great weight and is well made. It is generously sized as well--my last king comforter was several inches too small. Very happy with this purchase. This comforter is true to description and color in picture. I bought it for a guest room I was redecorating. 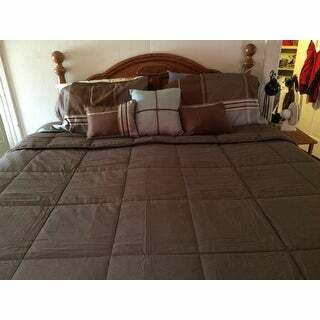 The quality is great as the fabric is soft and the weight feels very much like a down comforter. We have had 2 different family friends comment on how nice it is! Highly recommend this item. Bought this for my son that is about to leave for college. Washed it and it looks great. Super soft too! Great buy!! Super soft and comfy. Only wish it came with a fitted sheet but great for the price for sure! Nice set. I purchased the dark grey. Medium to slightly heavy in weight. Hated the pillow shams because the fabric is soft so the flanges just flop. I ended up buying regular pillow cases in a coordinating color and that worked fine. Comforter is large enough to cover the entire mattress on my king sized bed. Comforter is pretty flat out of the package but puffs up nicely after being on the bed for a few minutes. Great price. Very comfortable. Perfect for the weather here in Seattle. Great price. I also like the sand color. I will definitely come back and but another if I need more comforter in the future. The product packaging states another name for this comforter set, Not Porch &Den. Pleasantly surprised by this comforter. Color is great, shape is sized appropriately (most others are not wide enough or long enough). Overall....A+! Super soft! Fits My Above Average King Size Bed! Overall a amazing purchase! Would definitely recommend this to anyone looking for a cheap,soft comforter! Comes with 2 pillow cases and the comforter. Seriously so comfy and cozy. We use this without a sheet and love it. I just got my comforter it looks great on my bed. I can’t wait to sleep with it. The material is so soft it looks so inviting. So soft and comfy. I am planning to get another set of a different color because I like it so much! I plan on ordering another set and my daughter-in-law is ordering also after seeing mine. This was bought for my son, and he really like it. The size is great for his new bed, covers the mattress but not dragging on floor. He like the light weight feel, not too heavy when sleeping. The color was great as it went well with the sheets which I also bought. 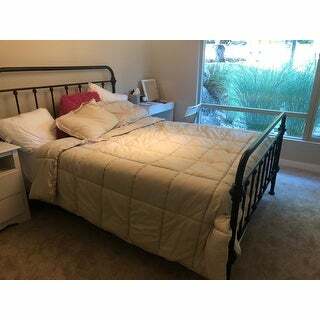 The sheets were slightly lighter in color and complimented the comforter. SO comfortable! Very very soft and fit my King size pillow top nicely! Very happy with this purchase! I'll be buying one for our spare room! Nice comforter. The color was accurate to picture described. Not as plush as I expected it to be but still nice and soft. Would recommend! Very soft and comfy.recommend washing it first has a weird odor taking out of the bag. But my son loves it! Now have a hard time getting him out of bed. "Is the grey twin/twin xl comforter the same color on both sides?" This product is the same grey on both sides. "What is the warmth rating / factor of this comforter? " "Is picture 26 the aqua color? Thanks. " Yes, the 26th image is of the aqua option. "Does the set come with sheets?" No, the sheets are not included. This is the comforter and two pillow shams. Materials are: down alternative, microfiber, polyester. "The pictures don’t have the color block names on them. Not sure the one I want is sand or or taupe? " "Is Cypress Green the light green or the dark green (like army green)??"